Symbols*: The rabbit leaps through a field of blossoming dandelions. The profusion of flowers connects with particles of star energy bursting into a night sky. 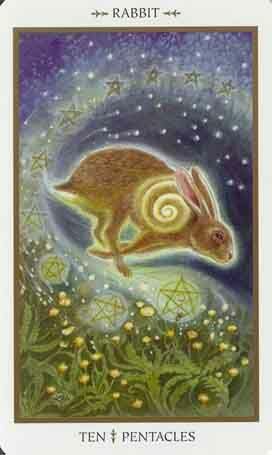 The rabbit epitomizes fecundity and continual life energy. The spiral on its form is radiating golden energy and echoes the spirals of energy that are emanating from the pentacles. Earth and sky become one. Day and night converge. The lunar and solar energies are an integral part of the life cycle. The procreative powers of the vigorously moving rabbit signify property and wealth that can be gained after a period of hard work. Being fastidious can reap long-term rewards, even if challenges threaten to disengage your spirit. Description*: The accumulation of wealth is not just isolated to the material. The satisfaction that you derive after enduring the many trials along the journey accentuates the healing nature of finally achieving your goals. You may see your responsibilities change and your personal needs adjust. This may reflect a desire for the intangible. Now is the time to indulge in happy times and reflect on your success, your relationships, and those things that transcend the superficial trappings of purely material concern. Possible Meaning: Things are now coming to an end, and new era of prosperity arises. You can now enjoy what you have made before. You are achieving your goals. This card is not only about the materials but also things intangible. Learn to adapt to new situations as things are moving fast. You will feel creative. Thoughts/Points to Ponder: The rabbit is running, he has a spiral on his side, the night sky is sparkling while the flowers on the ground are growing. The image to me represents fastness; fast movement, fast choices, fast adaptation. Yet somehow it is a very sensitive rabbit. The night sky reminds me of artistic capabilities. The Rabbit is known for its ability to procreate, its fleetness, and its movement is by leaps. People with this totem may find that their endeavors go in leaps and bounds also. If a Rabbit totem has appeared in your life, it may indicate a need for more planning or to check those plans already set in motion. Do not box yourself in a corner. This totem may also bring a need to examine the kinds of foods you eat. Perhaps a vegetarian diet, if only for a short time, can help you strengthen and heal.